Natalie Florence Kutoto aka Noti flow is a Kenyan female rapper and socialite. She has recently released a new song featuring Jackson Makini aka Prezzo called Tupendane. These two have been asked countless times if they are dating or not. And they have always denied these allegations despite the the many cozy photos that they post together. 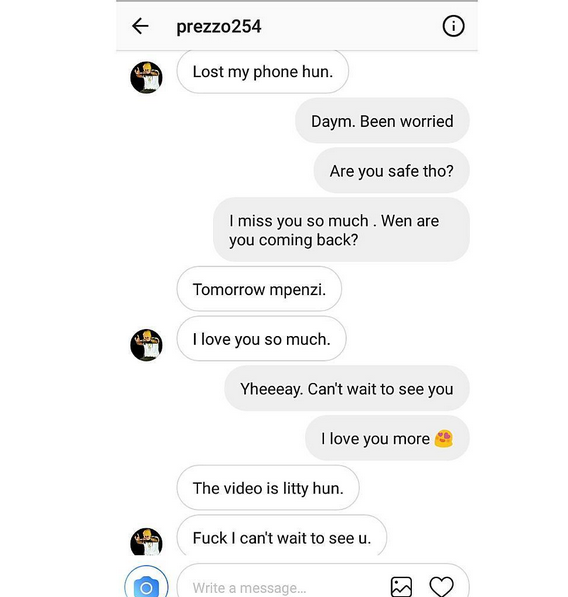 Noti Flow took a screenshot of a conversation she was having with Prezzo and posted it online. Previous articleInside Willy Pauls Sitting Room, Jameni Haringi Bure! Next articleDiamond On Frying Pan For Calling His Children ‘Sperms’, Did Zari See This?